While Chicago’s Atwood was undergoing a remodel this winter, Executive Chef Brian Millman was reworking the menu to jive with the restaurant’s more upbeat decor and expanded bar. Located in Kimpton’s Hotel Burnham, Atwood had a steady clientele of hotel guests. By adding a wide variety of small plates, Millman aimed to also attract groups of diners who preferred to eat like he did. “The revamped menu is about grazing, sharing and socializing over a meal,” he says. To avoid alienating regulars, he recast some of Atwood’s popular dishes in a more shareable format. 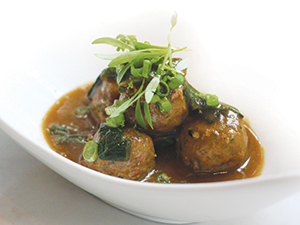 A Szechuan-style leg of lamb stir-fry, for example, was reinvented as lamb meatballs. By reformatting the dish—and using ground meat instead of sliced leg—Millman now is able to offer lamb for $15 instead of $35, appealing to younger diners. Millman buys ground lamb that a local farmer grinds from scraps. “The food cost is 23 percent, compared to 28 percent for leg,” he says. “And there’s zero waste, [so] it’s much more sustainable.” Millman cuts the lamb with about 20 percent ground pork to soften the texture and make the meatballs juicier. He seasons the mixture with cumin, cilantro and scallions. Then, he rolls it into balls that he browns and simmers in a Szechuan peppercorn sauce.